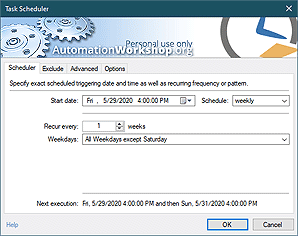 Track users logging in and out of the system with freeware User Logon / Logoff application that is integrated in Automation Workshop Free Edition, a Windows automation software. User Logon / Logoff detects when a particular or any user logs into or out of Windows and initiates the associated Task. Oftentimes, it is necessary to perform some operations upon user login or logoff. From tracking of user login / logoff to copying files, sending emails, executing scripts, that all can be done with Automation Workshop Free Edition. Free User Login / Logoff Trigger monitors the system continuously to run the Task as soon as user logs into or out of the system. Freeware User logon / logoff trigger detects logins and logouts of Windows users to initiate the automated Task when username and activity match the settings. Record Windows login / logout times. Send email notification about logon or logoff of particular user. Perform file operations or custom scripts whenever user enters or exits the system. Detailed overview of free User logon / logoff including the description of minute details is available on the website of commercial version of Automation Workshop. Overview · free User logon / logoff trigger features and usage summary. User · specify to detect particular or all users logging in or out the system. Options · set triggering delay and enable or disable the User logon / logoff trigger.